Did you know Ramset has three (3) National Service Center locations? Each location is fully equipped and staffed to provide you with the best possible service for your Ramset tools. Each location performs warranty, non-warranty and key account repairs for both Ramset gas and powder actuated tools. 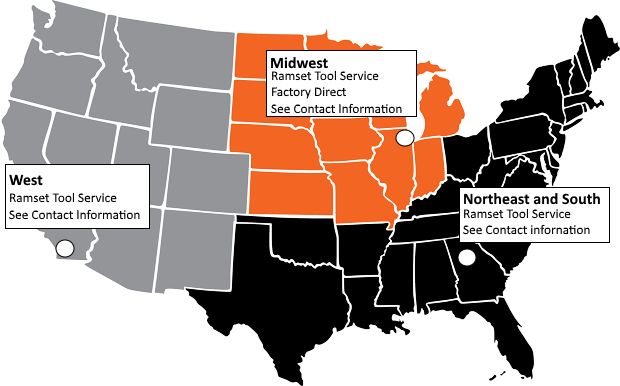 For the quickest turn-around time, we recommend using the Ramset Tool Service Center Map (below) to identify the Service Center in your region. UPS Ground Shipping is Free!! Our tool repair specialists know tools down to the smallest detail. Leave it to our experienced professionals to take care of your tools repairs. Our technicians identify the failure mode and take the corrective action. We’ll even put write up the corrective action on your invoice, so you’ll never be left in the dark about the repair. Our experienced technicians will make every effort to repair your tool within three (3) business days once we receive tool. Please note that occasionally we experience high demand therefore tool repairs may take longer than three (3) business days to repair. Original equipment manufacturer (OEM) parts are better for your tool than third party parts. We guarantee that we will repair your tools using the same parts it was built with. Note: Ramset will make every attempt to respond to emails within three (3) business days. If you prefer more immediate assistance, please call 800-222-6990.